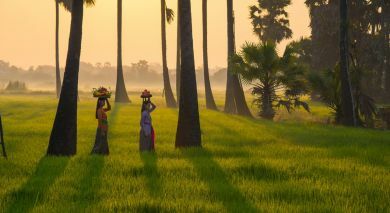 Kumarakom is a gentle town of mesmeric beauty, where marshy mangroves, brackish lagoons, and sweeping inland lakes criss-crossed by canals, vie for attention. Located close to the city of Kottayam, Kumarakom lies on the banks of Lake Vembanad, which is the largest freshwater lake in South India, and is considered the gateway to the backwaters of Kuttanad. 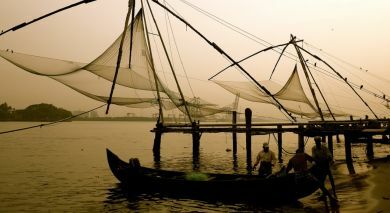 The town is included in the interior region known as the rice bowl of Kerala, due to its neighboring paddy fields and rice production, however it’s also able to supply delicious freshwater seafood! Authenticity without embellishments' is the motto of the Coconut Lagoon, a beautiful heritage resort on the Vembanad Lake. The Kumarakom Lake Resort is an aesthetic heritage resort, with numerous meandering canals, an Ayurveda Spa and luxurious villas and suites that are built on the lines of traditional Kerala homes, replete with new age amenities. (Only if staying at Philip Kutty Farm) Since Philipkutty’s Farm is located on a small island, it would be interesting to go cycling around the farm where coconut, nutmeg, banana and vanilla is organically cultivated. Magical boat rides in the canals surrounding the cottages are best enjoyed at sunset. The hotel also organizes day visits to churches and temples in the vicinity. Enjoy a unique experience with a half-day houseboat cruise on the famous backwaters of Kerala. Take in the tranquility of the greenery surrounding you, and see the life of the locals as it is on the backwaters as you gently cruise by. 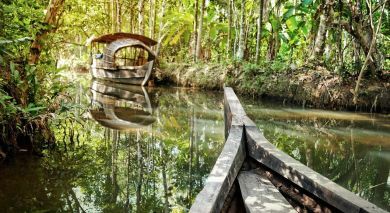 (Only if staying at Coconut Lagoon) Explore the expansive property of the Coconut Lagoon with a naturalist, where the beautiful gardens are ideal for butterfly and dragonfly watching. Spend your mornings engaged at a Kalarippayattu practice, which is a traditional form of martial art that originated in Kerala. 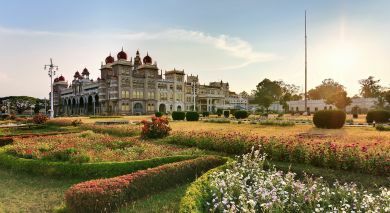 Alternatively, experience some quiet yoga and meditation, or indulge in a traditional Indian music performance. Take a leisurely village walk and relax with a private sunset cruise. Food lovers can learn the local cuisine, its ingredients and preparation styles at a cooking demonstration.